Song begins with one or more short, sharp &dquo;chip” notes, and ends in variable warble. 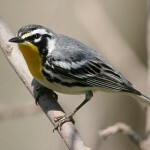 Description: Male is blue-gray above; bright yellow below; black streaking on breast; bold yellow spectacles; and white undertail coverts. 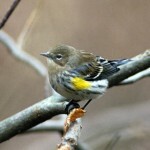 Female is duller overall; streaking on breast is dusky and indistinct. Behavior: Usually forages on low branches or in undergrowth, but sometimes seen fly-catching. Habitat: Migrants found in brushy areas near streams. Sometimes occur high in trees that are a considerable distance from water. 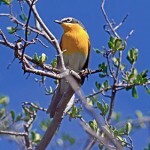 Where in Nebraska: Regular uncommon spring and fall migrant in eastern third of Nebraska, becoming rare further west. 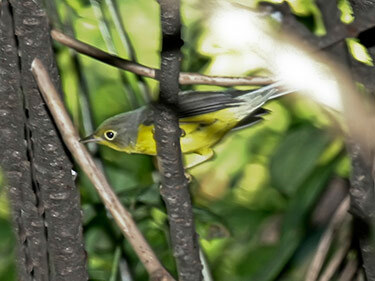 Fun Facts: The Canada Warbler is nicknamed the “Necklaced Warbler” because of the distinct black band and barring across the throat on an entirely yellow breast.